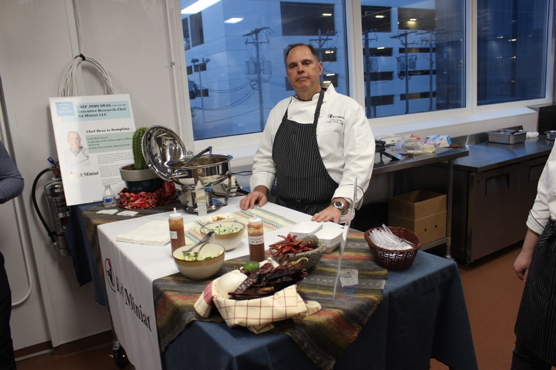 Under the expert tutelage of VP of R&D extraordinaire, Joe Farinella, our PD team works side-by-side with our flavor team on technically challenging formulations, enabling our clients to bring great tasting and innovative products to market. 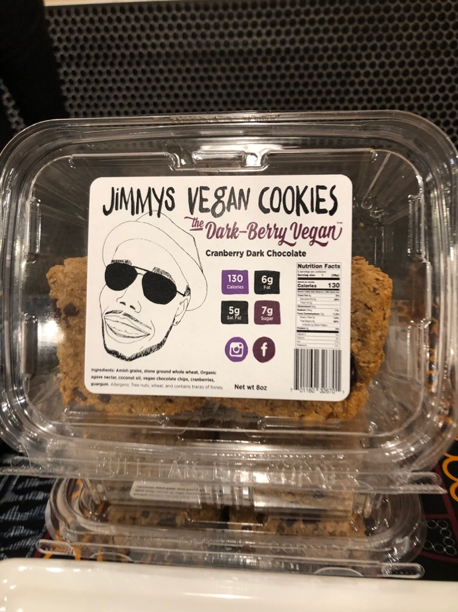 The team has really hit their stride in the past year, developing numerous plant-based dairy alternatives, protein waters, and nitrogenated cold brew coffees. Our business requires us to exercise discretion, but Milkadamia was so pleased with the result of their macadamia nut dairy alternative that their employees starred in a case study video that outlined Imbibe’s iterative process, challenges associated with building and flavoring plant-based beverages, and ultimate technical expertise that resulted in several SKUs of each of their product lines. Click here to learn more about Imbibe & vote for them in the small business category! 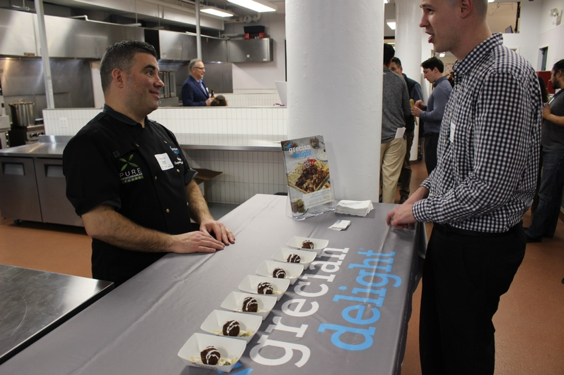 After much anticipation, our dine-around event, “Taste the Trends” took place in the brand-new space of Kitchen United River North on Thursday, April 4. 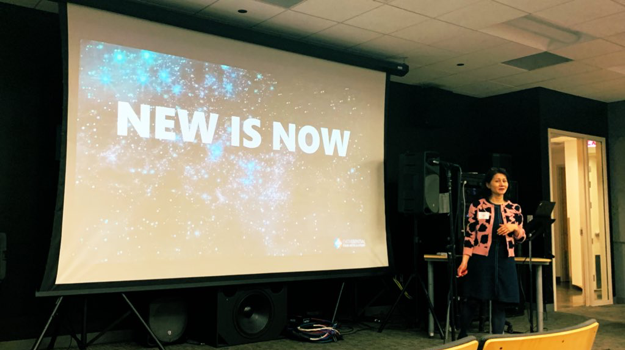 With over 100 guests in attendance, we were excited to showcase this event that we had been planning for months, with the help of our friends from Datassential and The Research Chef Association (RCA). Upon arrival, guests were split into two groups. 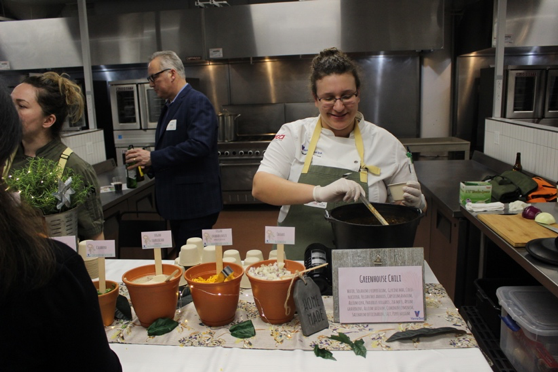 The first group joined Chef Jennifer Aranas for a presentation about food and beverage trends impacting the foodservice industry, which also gave a bit of insight into what the innovation chefs would be offering that evening. After the presentation, all guests were given the chance to walk the kitchens, converse with our chefs and sample their delicious dishes. 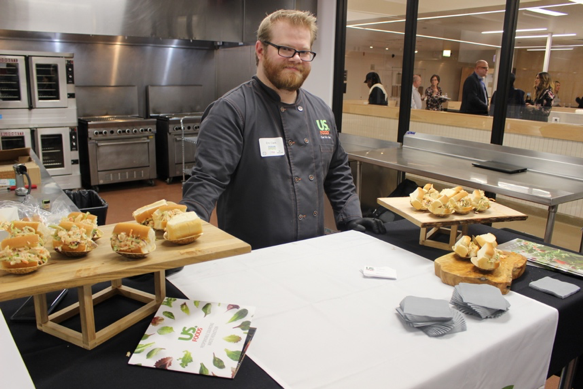 Chef Eric Clark, part of CFBN member US Foods’ culinary team, featured his dish, a global and sustainable Shrimp Roll made with Harbor Banks Argentine Red Shrimp and Rykoff Sexton Harissa Paste. 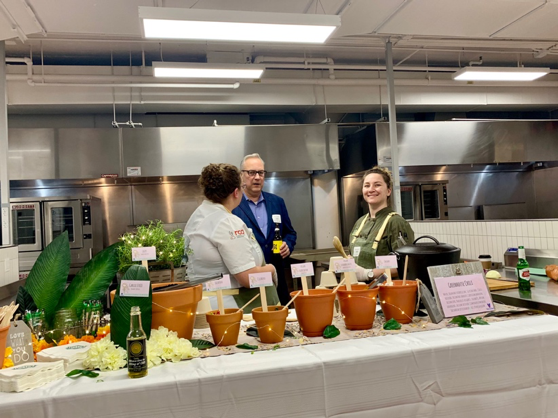 Chef Jaime Mestan, and her team from Vienna Beef, featured their Greenhouse Chili (with 100% plant based & vegan toppings bar), with CBD olive oil. 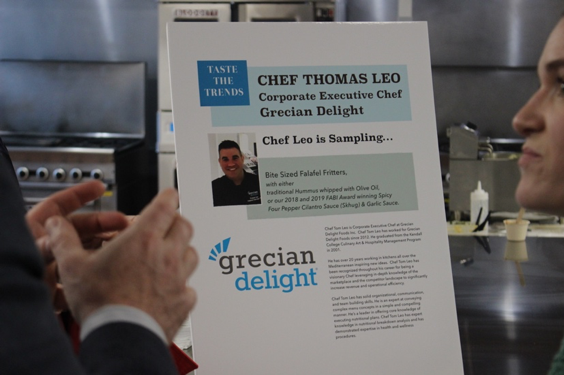 Chef Tom Leo, of Grecian Delight, featured his bite-sized Falafel Fritters, with traditional Hummus whipped with Olive Oil, and their FABI Award winning Spicy Four Pepper Cilantro Sauce (Skhug) & Garlic Sauce. Chef Jennifer Aranas giving her presentation on the popular food and beverage trends that we should be expecting this year. 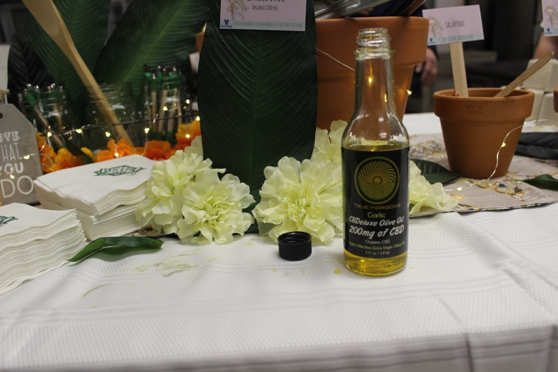 The event also involved sampling from two CFBN member companies – Jimmy’s Vegan and Mele Shake. On hand were Jimmy Prude to sample his vegan cookies, and Elise Tresley who sampled several of Mele’s shake flavors! Taste the Trends was our first two-part, interactive experience. We wanted our guests to truly gain a sense of the trends that are sure to be popular in 2019. 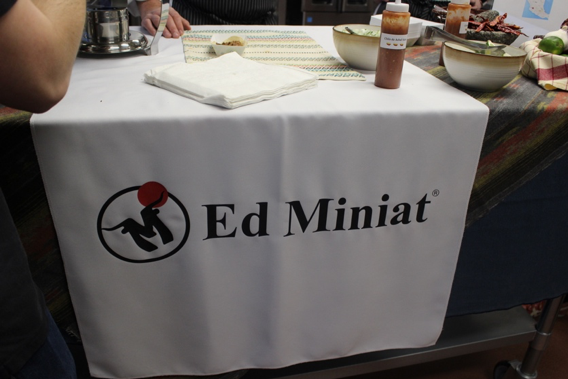 The innovation chefs did an outstanding job, incorporating unique flavors into their tasty treats. All in attendance had an amazing time and we look forward to having more tasting events in the near future. 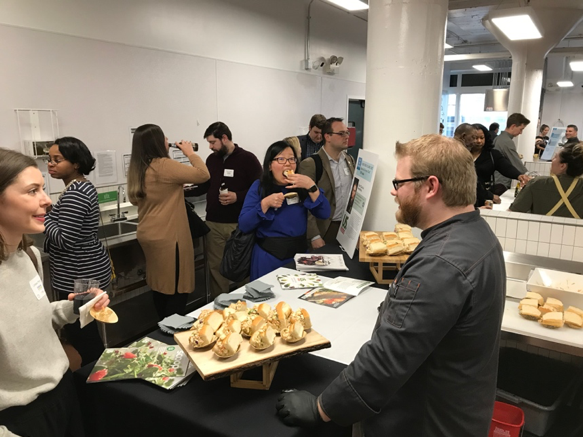 We want to send a big “thank you” to the Datassential team, the Research Chefs Association (RCA) and Kitchen United for supporting our efforts and making this magical experience come to life. Follow our chefs and start-up entrepreneurs on Twitter! Clean Label – Products with no artificial colors, flavors, sweeteners or preservatives have become standard in the natural food and products industry. Many brands called out natural ingredients on labels by making bold claims like “clean eats” or “cleanest protein.” Products in the sports nutrition and energy category that have typically used ingredients not perceived as natural are transitioning to cleaner ingredients as well. Brands showcased organic and/or natural energy drinks using ingredients like green tea, green coffee, guayusa, and yerba maté. Examples include Inko’s Organic Energy, Zola Hydrating Energy Drink, and Runa. 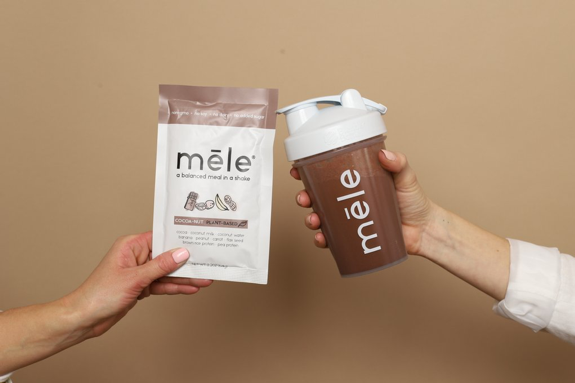 Additionally, several sports nutrition brands are transitioning to natural color, flavor and sweetener and incorporating plant-based ingredients that improve power and performance such as pea protein and MCTs. Examples include BodyLogix, Protein2O, and Aloha RTD plant-based protein beverage. Imagine you launched a successful consumer brand — a healthy, snack-size ice cream sandwich that has no fat, only three all-natural ingredients, actually boosts energy and tastes like the most indulgent dessert ever created. Even better, your brand has achieved success with key target consumers, and you’ve grown revenues to over $4 million. But to broaden distribution to a larger market and capture enough “share” — both the mind and market kind — you’re going to need capital. After working for many years in the private equity business with both legacy and emerging brands, I know that it takes serious money to grow your manufacturing footprint, find distribution partners, support a multi-channel advertising campaign and develop data analytics that show market-changing metrics. Whether you are a start-up or a legacy brand looking for investment capital to help you expand, or you’re ready to sell and move on to your next challenge, private equity or venture firms will put you through a due diligence process that can be onerous. It runs the gamut from financial review and risk tolerance to market size and trends, competition, sales and customer satisfaction. Today, smart brand owners are coming to the table with some of those key insights already in hand. A little background: we’ve seen a craft brands boom over the past decade, and many have found sticking power because they are purchased by market leaders who would rather buy a winning product than create one from scratch. Private equity and venture capital firms are also competitors for these market disrupters. But the competition for their money is fierce. And failures like the very publicized Theranos disaster have made the investor community cautious, no matter the category. What do you need to get past the gatekeepers and survive the rigor of due diligence? I submit, consumer testing. Recently, my company launched a consumer-testing platform called eFive™, a sensory and product insights platform designed to give both legacy and emerging brands quick, accurate and affordable consumer insights from industry-leading sensory experts. The insights provide a wealth of information on topics such as: product readiness for expansion, consumer purchase decision process, market and demographic opportunity, flavor and texture profiles, and – this is key – how the brand performs against the competition. When you are ready to sell your brand, doesn’t it make sense to have already checked some of the major boxes associated with due diligence? eFive™ not only provides consumer insights on how a product appeals to the senses: taste, touch, sound, flavor and texture; it also answers critical questions on packaging. Does the brand packaging convey a believable value proposition? Is it engaging? Does it communicate the key product differentiator? Emerging CPGs that are serious about selling a successful brand or taking it to the next level partner with e-Five to prove out product claims, measure overall ‘liking’ among a target demographic and test their product against a market leader. Services include onsite consumer testing at facilities in Chicago, Dallas, New York and San Francisco markets, as well as focus groups and even at-home research to gain insights on real-life consumer experience with products. The platform enables brands already in the market to make vital adjustments to improve market performance. And for those brands seeking investment capital, these data points can speed the process significantly. Mr. Bisceglia served as an Operating Partner at Sterling Partners for 2 years before joining Curion Insights as CEO and overseeing the launch of eFive™. Bisceglia’s business success began 25 years ago when he founded TFA, a technology-focused ad agency that achieved significant success. TFA was sold to Leo Burnett in 1998. Bisceglia then partnered with William Blair to acquire CPRI, where he doubled revenues in less than 2 years. In 2007, he founded TalentDrive, one of the first technology-enabled staffing businesses. Member Randy Bridgeman was a recent finalist for the "Food & Beverage Dealmaker of the Year"
Perkins Coie is pleased to announce that partner Randy Bridgeman was a recent finalist for the “Food & Beverage Dealmaker of the Year” category in The Deal Awards Middle Market, which recognizes leaders and innovators in the world of dealmaking. Over the past several months,The Deal received hundreds of submissions, nominating individuals and firms across dozens of categories and sectors. The awards covered deals involving at least one U.S. party that clocked in at under $500 million. Randy Bridgeman, co-chair of the firm’s Corporate & Securities practice, recently led a series of cross-border, co-manufacturing joint ventures for a global food manufacturer as well as the sale of a family-owned business specializing in the production of caramel color for beverages. Known for immersing himself in his clients’ businesses and industries, Randy has extensive experience representing companies with domestic and overseas operations in the food and beverage sector. The Deal is an intelligence service that provides actionable information on deals and dealmakers, offering over 100,000 users the unique opportunity to identify potential deals and target dealmakers to accelerate revenue generation. The Deal Awards Middle Market recognizes the leading lawyers, bankers, investors and advisers in middle-market transactions. Kellogg announced Monday that it is selling Keebler, Famous Amos and other snack brands for $1.3 billion cash to chocolate confectioner Ferrero. Ferrero is best known in the U.S. as the maker of Nutella. Known for its cereals, crackers, salty snacks and toaster pastries, Kellogg recorded about $13.5 billion in sales in 2018. Its cookie business, which includes Keebler, Mother's, Famous Amos and Murray's, netted about $900 million last year. Shares of Kellogg fell about 1 percent in morning trading. 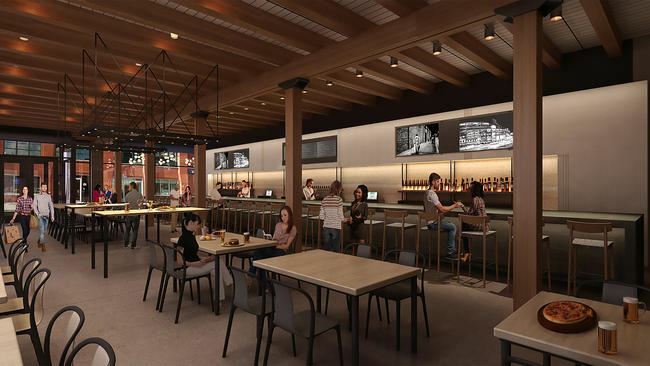 Fulton Galley, an innovative food hall opening in June at 1115 W. Fulton Market, has announced the chefs and concepts that will occupy the nearly 13,000-square-foot space. The Fulton Market project, announced last fall, will be the fifth for the Pittsburgh-based Galley Group, which creates low-cost, low-risk launching pads for new restaurant projects. Mantica said he and partner Tyler Benson sifted through about 40 applicants before setting on the final five — which are all the restaurants Fulton Galley will hold. Expanding industry opportunities for strategic collaboration and data capture. How blockchain can help overcome traceability and food safety challenges. Controlling the “Amazon effect” by addressing the truck driver shortage, rising transportation costs, and profitability. Kellogg Company, a leading global cereal and snacks manufacturer, has been recognized by the Ethisphere Institute, a global leader in defining and advancing the standards of ethical business practices, as one of the 2019 World's Most Ethical Companies. Kellogg has been recognized by Ethisphere for 11 years. The company will be listed under the Food Processing & Distribution category. It’s been about two weeks since Origin Almond unofficially relocated its HQ from Philadelphia to Chicago to join Springboard Brands, the Kraft Heinz incubator. My beverage startup, out to reinvent premium juice with a low-sugar alternative via our innovative Almond Juices, was selected by Kraft Heinz out of an applicant pool of hundreds of other emerging natural food brands to join the program.